Man walking with his furs. Courtesy of the National Park Service. During the late-1600s the North American fur trade began with France and Britain vying for control over the abundant resources afforded by the pristine continent. Around the mid-1700s, France claimed the Mississippi River and all land drained by its tributaries including the port of New Orleans and the Louisiana Territory but due to Napoleon Bonaparte’s war debt, France was forced to sell the Louisiana Territory to the newly-formed United States of America in 1804. 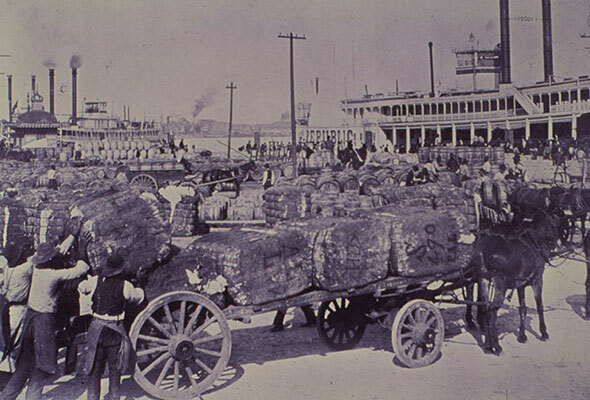 France established trading posts to exchange manufactured goods for furs with the Native Americans prior to losing possession of Louisiana Territory. One of the posts was named after France's King Louis IX; it prospered and grew to become the fourth-largest city and the Gateway to the West during the 1800s. Colorful St. Louis was a European colony on the edge of the frontier. Its founders were merchants determined to increase wealth through trade, at times to the neglect of farming. The result was occasional shortages of food, earning St. Louis the nickname, "Pain Court," or "Short of Bread." Peaceful exchanges were one of the hallmarks of the early fur trade era. The Osage, Saux and other tribes frequently visited St. Louis to trade furs for tools, cookware, blankets and other items manufactured in Europe. St. Louis merchants formed companies to trap furs in the western territories after The Louisiana Purchase. William Ashley advertised in 1822 for "ONE HUNDRED MEN, to ascend the river Missouri to its source, there to be employed for one, two, or three years." Fur traders caravan leaving St Louis. Courtesy of the National Park Service. 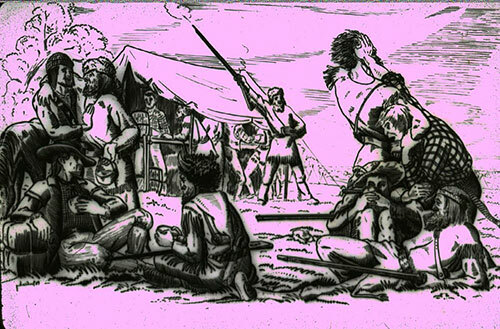 The fur trader camp. Courtesy of the National Park Service. 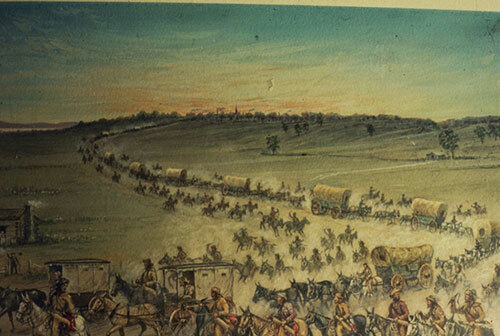 Those who answered William Ashley to migrate to the Rocky Mountains began one of the most storied chapters of American history. They would be known as “Mountain Men” who were fur trappers and often characterized as rugged, individualistic and resourceful. Months at a time they would live in the isolated Rocky Mountains and benefit from on the demand for beaver pelts by trapping and preparing fur for trade. The highlight of the hunters' year was The Rendezvous. 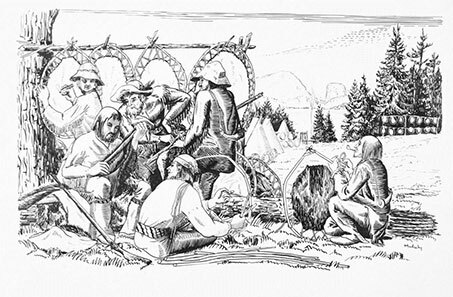 Intended as a business meeting, The Rendezvous grew into a "trapper’s holiday" where they gamed and gaffed, or spear fished, for days on end before going back to a solitary season in the mountains. 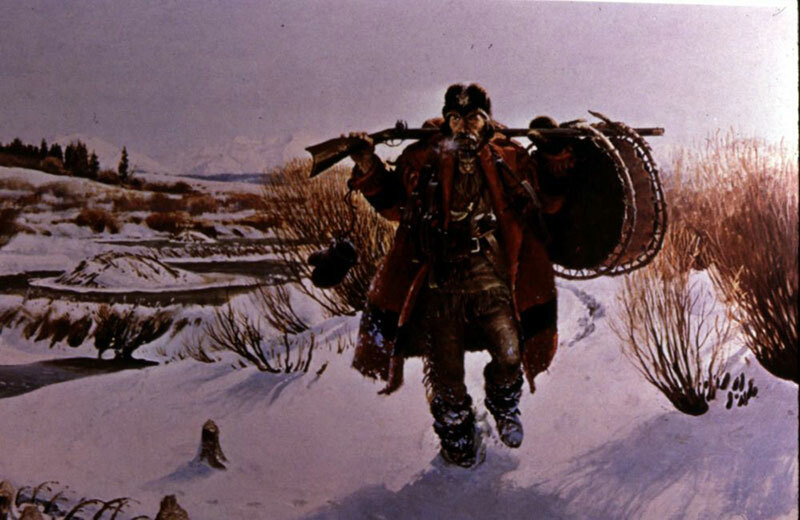 As the westward movement was happening the trappers became pioneers themselves. When fashions started to change in the favor of silks and other materials over fur, the industry declined. Mountain Men adjusted by taking jobs as guides and their influence created a lasting legacy in U.S. history. Their time in the American West was roughly short but between 1810 through the 1880's they were instrumental in opening up the various Emigrant Trails allowing Americans in the east to settle in the new territories. 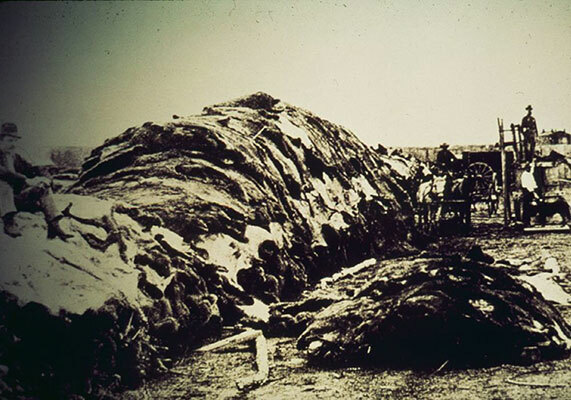 Their search for untapped resources of beaver pelt opened the Rocky Mountain region for settlers traveling through on their way to settle in Washington and Oregon. Stretching, marking and drying beaver pelts. Courtesy of the National Park Service. The Mountain Men Museum Education Program at Jefferson National Expansion Memorial looks back at the early American fur trade and its impact on America's expansion during the 1800s. 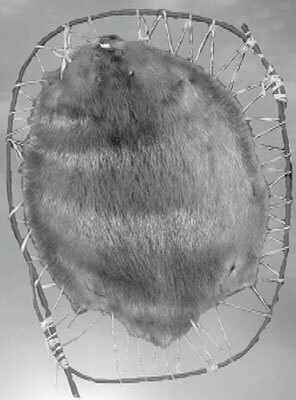 A pelt. Courtesy of the National Park Service. Loading furs. Courtesy of the National Park Service. Piles of furs and hides. Courtesy of the National Park Service.